GameCube titles as varied as Mario Power Tennis, Pikmin and Resident Evil 4 have all recently made the transition over to Wii with some degree of success. Some have fared better than others, but the general consensus is that if judiciously applied, motion controls can make a good game even better. 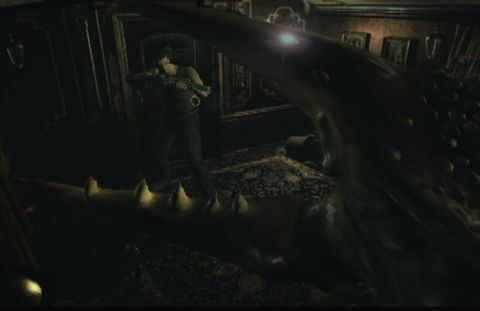 The defiantly old-school Resident Evil Zero, on the other hand, was always unlikely to benefit from this treatment. The last of the traditional Resident Evils, Zero’s flick-screen scrolling and awkwardly robotic third-person movement seemed dated even back in ye olde 2002. But cram it into the Wii’s luminous blue cakehole today, and you won’t know whether to play it or to call an archaeologist. Worse still, there has been absolutely no attempt to bring it up to date on the new architecture. There are no motion controls, the pointer goes unused, and there isn’t even a widescreen option. In fact, the only notable change is that the text is now in that really ugly default Wii font (you’d know it if you saw it). Oh, and it now comes on just one disc instead of two, which is a massive bonus in some sort of parallel universe where swapping a disc over every four hours is a kind of grave hardship. Resident Evil Zero isn’t terrible, but the games have moved on so much in the last decade that there’s really no value in revisiting it in this form. The zombies are still pretty scary, but blow a wad of cash on this relic, and you’ll be the one vying for blood. Taking place just before the events of the first Resident Evil, this prequel tells how the mansion fell.